Step One – Baste your side gores, one to each side of the front and one to each side of the back. Baste each small triangle piece to the front side gores (item 3 on layout page). Baste the back sides together leaving the space for the large triangle gore (item 3 on layout page). Baste your front side gores to the back side gores. Now try on your kirtle and lace it up. You might want someone to help you here but I manage this pretty well on my own. 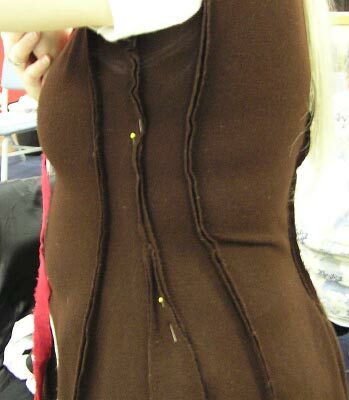 At this point start pinning your side gore seam on each side until you get a fairly good fit. You will then want to have someone (or take it off, pin it and adjust) pin your back seam to fit the shoulder area and the small of the back. 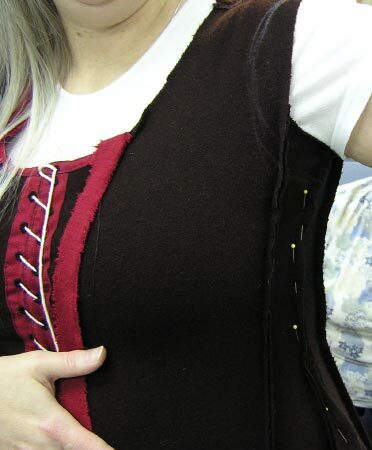 Step Two – Remove your kirtle and re-baste the seams that need adjusting. Then try on again and confirm fit. a tighter, more supportive kirtle. There is evidence that the kirtles (and pourpoints for men) were tight enough to make the waist wrinkle, sometimes quite a lot. Thus ends the mystery of kirtle construction the rectangular transition way. At this time you might want to finish your seams in one of the methods outlined on the seams page (coming soon).